Dr Andrew Veale is a pioneer of sleep therapies in New Zealand. He founded the first oximetry and polysomnography clinic at Greenlane Hospital during the 1980s, when the field was still in its infancy. In the years since, investigations and treatments have advanced significantly and better technologies have evolved. In recognition that common conditions such as snoring and sleep apnoea affect the upper airway and breathing, the natural progression was to treat sleep and respiratory disorders from the same facility. Sleep and breathing disorders are often interconnected so it makes good sense to bring a team of complementary consultants together under one roof. 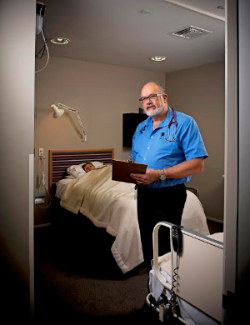 Our private clinic is a state-of-the-art medical facility in Greenlane, Auckland. The benefits of a ‘one-stop shop’ for clients are timely treatment and an integrated approach. Diagnosis is supported by extensive on-site testing while the provision of specialist-led therapies delivers high-quality holistic care.